Committed to improving the wellbeing of people and the planet through the provision of organic and ethically traded herbs, Pukka Herbs has just announced the launch of its new supplement range, Pukka Organic Wellbeing. After three years of extensive research and development, Pukka has combined the latest advances in scientific techniques with its expert herbal wisdom to create an incredible new range of organic food supplements. Using new supercritical extraction methods combined with traditional water-soluble components, Pukka achieves a more powerful and ‘wholistic’ approach – Pukka is only one of a few companies in the world applying these advances. Applying these techniques to the highest quality herbs from around the world, Pukka Organic Wellbeing really is POW – powerful, organic and whole-spectrum. Pukka’s new formulation is accompanied by a new look and feel and categorised by condition. Each new ‘family’ of Pukka Organic Wellbeing corresponds to a particular need and is distinguished by a different colour – making it easy for consumers to find one specific to their own needs. ‘We wanted to bring things alive with colour and the typical Pukka beauty, whilst at the same time make it as easy as possible to navigate the category’, says Marketing Manager for Pukka Organic Wellbeing, Liz Iles. • Active: Designed to sustain ‘get up and go’. • Every day: Boosts vitality to put a spring in your step. • Women: Nourishes and supports every stage of female life. • Moods: Specifically designed to combat the pressures of hectic everyday life. • Digestif: Addressing the everyday needs of the body. • Seasonal: Designed to help build a natural, seasonal armoury. Today, more and more people are seeking alternatives to boost their wellbeing, and to help maintain their hectic lifestyles. 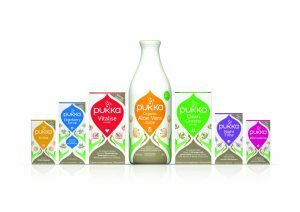 The Pukka Organic Wellbeing range is a natural and effective way to gain a healthier and more balanced lifestyle. Rude Health is the official magazine of the Irish Association of Health Stores.